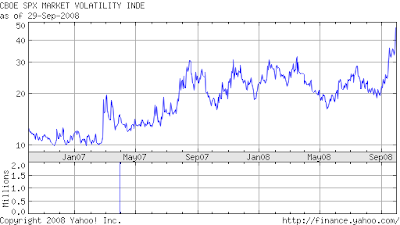 The VIX index, shown above, uses options prices to measure expected stock market volatility over the next 30 days. It closed yesterday at an extraordinarily high 46.72. Meanwhile, the TED spread, the difference between the interest rates on inter-bank loans and T-bills, stands at an extraordinarily high 325 basis points, suggesting heightened anxiety about bank defaults. The Federal Reserve will pump an additional $630 billion into the global financial system, flooding banks with cash to alleviate the worst banking crisis since the Great Depression....The Fed's expansion of liquidity, the biggest since credit markets seized up last year, came hours before the U.S. House of Representatives rejected a $700 billion bailout for the financial industry. Spotted at National Airport, presumably on its way to the Treasury Department. Thanks to the former student who sent this in. I will be speaking at the 4th Annual Economics Teaching Conference run by the Gulf Coast Economics Association. It will be held November 6 and 7, 2008, in San Antonio, Texas. If you are interested in attending, sign up here. For Harvard students, from the Harvard Hooligans. 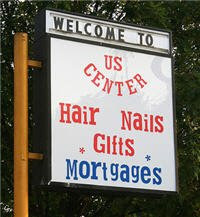 I presume this store is now sticking to Hair, Nails, and Gifts. Update: Here is a related news video. Did anyone say "capital flight"? "The decree appears to be Beijing's first attempt to erect defences against the deepening U.S. financial meltdown, after the mainland's major lenders reported billions of U.S. dollars in exposure to the credit crisis," the SCMP said. Update: Another news report contradicts this one. I read your blog post "If I were a member of Congress..." Although I did not write the letter mentioned in the post (most of the credit should go to Luigi Zingales and Paola Sapienza), I signed it, asked other people to sign it, and discussed with them why I opposed the Paulson plan. I thought I would take your bait and explain my reasoning. Before doing so, let me be clear that I agree with your comments about Ben Bernanke. I too know him well from the seven years I spent with him on the faculty at Princeton and I share your respect for his intelligence. I also recognize that he is far better informed about the current situation than I am. This does not, however, mean that he is perfectly informed. Indeed, looking back over the last 13 months, it should be clear that the Fed and Treasury have repeatedly underestimated the extent of the problem. In such an environment, the distributed knowledge of professional economists and other imperfectly-informed observers may be superior to the knowledge of the Fed staff. In other words, you write, "In his capacity as Fed chair, Ben understands the situation, as well as the pros, cons, and feasibility of the alternative policy options, better than any professor sitting alone in his office possibly could." That may be correct, but I am not convinced that he understands the situation better than the collective wisdom of all professors. Next, let me explain what I think is happening in credit markets. This is my assessment, formed through numerous discussions with colleagues, not necessarily the opinion of other signatories of the letter. As everyone now knows, financial institutions hold significant assets that are backed by mortgage payments. Two years ago, many of those mortgage-backed securities (MBS) were rated AAA, very likely to yield a steady stream of payments with minimal risk of default. This made the assets liquid. If a financial institution needed cash, it could quickly sell these securities at a fair market price, the present value of the stream of payments. A buyer did not have to worry about the exact composition of the assets it purchased, because the stream of payments was safe. incentive to estimate how much those securities are worth. This is the crux of the problem. Now anyone who considers purchasing a MBS fears Akerlof's classic lemons problem. A buyer hopes that the seller is selling the security because it needs cash, but the buyer worries that the seller may simply be trying to unload its worst-performing assets. This asymmetric information this makes the market illiquid. To buy a MBS in the current environment, you first need an independent assessment of the value of the security, which is time-consuming and costly. Put differently, the market price of MBS reflects buyers' belief that most securities that are offered for sale are low quality. This low price has been called the fire-sale price. The true value of the average MBS may in fact be much higher. This is the hold-to-maturity price. This program does not solve the lemons problem. 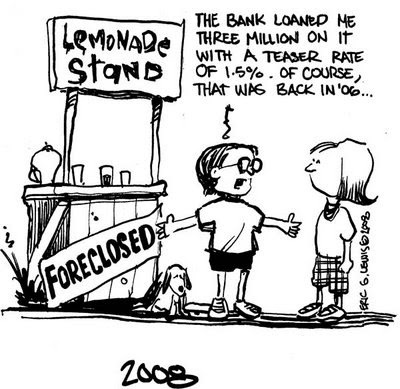 The government purchases a lot of lemons at an inflated price. This improves the balance sheet of the firms that can sell their worst securities. It also improves the balance sheet of firms that own better securities because the market price of those securities will increase. (Of course, it cannot increase too much, or no one would sell to the government. They would wait to sell at the higher market price. I have not worked out the equilibrium of an auction with an option to resell later. It seems complicated.) But this is fundamentally no different than giving taxpayers' money to owners, managers, and debt-holders of firms that made the worst decisions. The government does have one way tool at its disposal that would allow it to directly address the lemons problem. The clear advantage that a government has over the private sector is its ability to force individuals to participate in mechanisms that cross-subsidize other participants. This ability to coerce can be critical in markets with adverse selection. In this instance, the government could force all financial service firms to raise capital, as proposed by my colleagues Douglas Diamond, Steve Kaplan, Anil Kashyap, Raghuram Rajan, and Richard Thaler in today's Wall Street Journal Asia. This mandate would eliminate the lemons problem. Along the way, the scrutiny from potential buyers might help uncover which firms are in fact insolvent. Other types of coercion might have similar effects, but superficially seem less appealing. For example, the government could force all owners of MBS to sell them to the government at the expected hold-to-maturity price. This would again be a subsidy to the owners of bad MBS, but now at the expense of the owners of good MBS rather than the taxpayer. Since there is no currently no market for those securities, it is conceivable that everyone would gain from the increase in liquidity. Still,I would imagine that the unforeseen costs of such an extraordinary action would outweigh its benefits and I suspect that market participants would agree. What else can the government do? First, it can establish stable rules and play by them. Holding out the possibility of distributing vast sums of money in an unspecified manner does not help market participants value the securities or value the firms. Second, it can prevent panics, i.e. Diamond-Dybvig bank runs. This is what it did when it offered insurance for money market mutual funds, an important source of funding in the commercial paper market. So far, that market appears to be holding up. Third, it can reduce the risk that its current actions encourage future misbehavior. We have already seen evidence of moral hazard in these markets, for example in AIG's decision to turn down a $8 billion offer from J.C. Flowers during the weekend before AIG collapsed. In closing, let me mention one other issue that I take very seriously. I recognize that this might not matter much to my Congressman, but in my view it may be the most important issue for global welfare. The U.S. has long been a beacon of free markets. When economic conditions turn sour in Argentina or Indonesia, we give very clear instructions on what to do: balance the budget, cut government employment, maintain free trade and the rule of law, and do not prop up failing enterprises. Opponents of free markets argue that this advice benefits international financiers, not the domestic market. I have always believed (at least since I began to understand economics) that the U.S. approach was correct. But when the U.S. ignores its own advice in this situation, it reduces the credibility of this stance. Rewriting the rules of the game at this stage will therefore have serious ramifications not only for people in this country but for the future of global capitalism. The social cost of that is far, far greater than $700 billion. I have gone on too long, but I strongly believe that this is an issue where the input of outsiders like myself is useful. Feel free to post this if you see fit. Thanks, Rob, for sharing your views. By taking an ownership stake in the firms, the government can minimize the consequences of overpaying for the assets. It would own a piece of the very company that was benefited from the overpayment. There is, however, a significant problem with the warrant idea: It makes designing the auction to get the price right much harder. Suppose that several banks own a particular type of mortgage-backed security. As I understand it, the Treasury would run a reverse auction to find which bank would sell the MBS at the lowest price. Competition among sellers should drive the price close to the actual value of the asset as judged by the banks. But if each bank is required to sell the MBS together with a warrant on the bank's stock, then the items being sold are no longer comparable. A warrant on one bank does not have the same value as a warrant on another. How then can you run a competitive auction to find which bank is offering the best deal? I suppose Treasury could hire option pricing experts to net out the value of the warrant from the price of the package to find the net price of the MBS. But doing so would certainly add noise to the process and make it harder for Treasury's auction experts to make sure the taxpayers is getting the best price for the securities it is buying. Warren Buffett did not need to worry about this problem. He set the price for his position in Goldman based on his expert judgment, not an auction. But Treasury needs to find a more objective mechanism for setting prices of the things it buys. Auctions are precisely that mechanism, but they would do their job less well if an equity stake in each company is part of the deal. It does seem to be Intrade specifically that's out of line, rather than Betfair. At Iowa Electronic Markets, yet another political futures exchange, the probability of the Democrats winning the popular vote is about 61 percent. They don't have an electoral vote contract, but if they did, presumably that number would be a little higher because of the structural advantages Obama has in the electoral college this year. The best predictor of college success is not the SAT, but rather tests that examine knowledge of a standardized curriculum, such as SAT subject tests, said [Harvard's Dean of Admissions William] Fitzsimmons. The article also suggests that Harvard might at some point make the SAT optional and, in its place, rely more heavily on SAT subject tests in making admission decisions. If you are interested, please drop off a brief letter, resume, and transcript with my assistant Lauren La Rosa in Littauer 230. * Just kidding. About the compensation, that is. The job is real. And compensation will be in the form of fiat money, which is worth something, at least for now. Update: The job has been filled. Sen. McCain suggested that he might replace the head of the Securities and Exchange Commission with a Democrat, suggesting Andrew Cuomo, New York state's attorney general. "He is somebody who could restore some credibility, lend some bipartisanship to this effort," Sen. McCain said on CBS's "60 Minutes." Thanks for the blog and for your textbook. Your Intro to Econ text was the first required textbook in my academic career that I didn't hate. Update: Naked Capitalism's analysis of the plan is well worth reading. Krugman: Bad move on my part. Wisdom from David Brooks and Gerard Baker. For one day at least in this politically-charged election season, Democrats and Republicans on Capitol Hill appear to have buried the hatchet. In the wake of the Federal Reserve's bailout of insurance giant American International Group Inc., Mr. Bernanke's standing with Congress seems rockier than at has been in his two-and-a-half year tenure as Fed chairman. Meanwhile, Rep. Jeb Hensarling (R., Texas), leader of the conservative Republican Study Committee, is gathering signatures for a letter to Messrs. Bernanke and Paulson stating that government bailouts "have set a dangerous and unmistakable precedent" for the federal government. "Federal investment in such large amounts of private ompany stock has the appearance of a socialist and not a free-market approach to managing our economy," the letter says. Rick says not to worry. PARIS - Plastic forks, disposable diapers, drafty houses - if it hurts the environment, make it cost more. That's the message France's government wants to send with a raft of proposed new taxes. France's ecology minister said Sunday the government is considering a "picnic tax" on disposable dishes to encourage people to use reusable plates and cups instead. Speaking on Europe-1 radio, Nathalie Kosciusko-Morizet said the plan wouldn't stop at picnicware. For example, she said, "We could make it so that in all public maternity wards, you would be taught to use washable diapers." She said a new carrot-and-stick plan already applied to cars is being spread to other environmentally damaging products such as paints and detergents. The key question: Are there really significant externalities associated with all of these goods? I would like to see the evidence before I embrace these plans. But I can certainly appreciate the economic logic. We should be making new compacts to reduce barriers as rapidly as possible rather than fearing to implement those already negotiated, such as the free-trade agreements with Colombia and Korea that are languishing in Congress. From north of the border. Ken says it's good that Uncle Sam will let Wall Street firms fail. 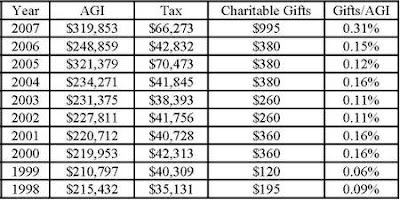 If Biden's below-average charitable giving is typical of those with his political views, why am I surprised by it? Because this man has run for President more than once. He must have known there was a good chance that his tax returns would at some point be made public and undergo close scrutiny. He had a far greater-than-average personal motivation for charitable giving and, nonetheless, chose not to chip in. Some economist (I forget who) once called it "the best way to destroy a city, other than bombing." Click here for a nice discusssion from today's paper. Update: Robert Bartley says the economist is Assar Lindbeck. According to the betting at Intrade, John McCain is now the most likely next President. The market probability of his winning is just a bit more than 50 percent. I am spending today and tomorrow here. It is widely assumed that health care, like most aspects of American life, shamefully shortchanges the poor. This is less true than it seems. Economist Gary Burtless of the Brookings Institution recently discovered this astonishing data: on average, annual health spending per person -- from all private and government sources -- is equal for the poorest and the richest Americans. In 2003, it was $4,477 for the poorest fifth and $4,451 for the richest. Probably in no other area, notes Burtless, is spending so equal -- not in housing, clothes, transportation or anything. Why? One reason: government already insures more than a quarter of the population, including many poor. From club member Ted Gayer. What kind of tax policy will we get if John McCain is elected President? He says he wants to make the Bush tax cuts permanent. But is he likely to deliver that outcome in the face of a presumptively Democratic Congress? We can get some insight into this question using Intrade betting and some basic rules of conditional probability. P(tax hike / McCain) = 0.72. That is, according to the Intrade betting, we are likely to see a significant hike in the top income tax rate even if McCain is elected President. Here is my column in tomorrow's NY Times. 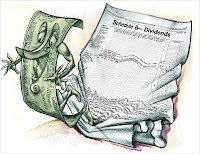 The bottom line: On the issue of dividend taxation, Barack Obama may be the candidate with the best chance of preserving George Bush’s legacy. Professor Glaeser wants more attention paid to human capital. According to the betting at Intrade, over the past two weeks, while the two political conventions were taking place, John McCain added about four to five percentage points to his probability of becoming the next president. He is still the underdog, but the race is closer. Bob Solow skewers Kevin Phillips. In regard to Martin Feldstein and John B. Taylor's "John McCain Has a Tax Plan to Create Jobs" (op-ed, Sept. 2): Barack Obama is proposing large middle-class tax cuts to reward work, encourage wealth accumulation, and stimulate economic growth. John McCain is proposing little in direct tax relief for middle-income families and has proposed a health plan that would, over time, represent a significant tax increase for most American families. You don't have to take my word for it. The National Review editorial board recently complained that Sen. McCain's plan "offers very little in the way of direct benefits to Americans in the middle of the income scale." Rea Hederman, senior policy analyst at the conservative Heritage Foundation praised Sen. Obama's tax plan as "a great step in the right direction," and explained that "the middle class would likely pay less under Mr. Obama's plan than Mr. McCain's." And even the conservative Tax Foundation confirmed as "correct" that 101 million tax filers would get nothing from Sen. McCain's middle-class tax cuts. Faced with these facts, Martin Feldstein and John Taylor are forced to misrepresent the Obama and McCain plans. They say Sen. Obama is proposing only a one-time $1000 rebate. In fact, Mr. Obama has proposed a permanent $500 per worker/$1000 per two-earner-family tax credit to offset the payroll tax. They say that under Sen. McCain's health-insurance plan "most taxpayers will also pay less in tax." In fact, Mr. McCain's plan introduces a new tax on employer-provided health insurance benefits together with a new tax credit that does not rise with the cost of health insurance. As health-care expenditures rise faster than overall inflation, the tax increase in his plan rises much more quickly than the value of Mr. McCain's health-insurance tax credits -- resulting in a net tax increase for tens of millions of working families. Mr. Liebman is an economic adviser to Sen. Obama and Professor of Public Policy at Harvard University where he co-teaches "American Economic Policy" with Martin Feldstein. I saw this morning that you posted a letter by Dr. Liebman on your blog (to which I subscribe). The letter does not accurately reflect my comments on the Obama tax plan. Dr. Liebman has sliced my quotes well out of context. If you read the full article in the NY Sun (August 15) you will see that my quote--'great step in the right direction'--refers to reductions in the tax rates for capital gains and dividends to 20%, which is far lower than the 25% or 28% that seemed to be contained in Senator Obama's tax plan at beginning of the summer. Heritage and the Tax Policy Center both started our initial assessments of Senator Obama's tax plan with the capital gains and dividends tax rate being raised to 25%. I do think it's a step in the right direction that the Obama campaign has decided not to raise the cost of capital by as much as they planned in the beginning of the summer. 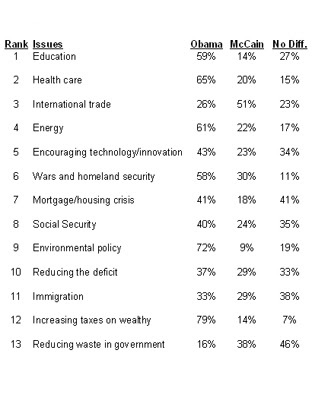 But, as I noted later, it would be even better not raise taxes on capital at all. Dr. Liebman also did not include my comments that Senator Obama is reducing middle class taxes in the wrong way. He complicates the tax code with messy tax credits that will do a host of harm to growth and fairness in the tax code. Three points regarding Mr. Hederman's email. First, I note with interest that he did not disavow his statement that the middle class would likely pay less taxes under Mr. Obama's tax plan than under Mr. McCain's. The simple fact is that Heritage has now confirmed what the Tax Policy Center and others have said – Obama has larger middle class tax cuts than McCain. Of course Heritage has different ideas about how taxes should be cut, but that wasn't the Feldstein-Taylor argument. They were disputing the relative comparisons of the size of the tax cut. So I do not think I was unfair to Mr. Hederman in using him as a reference on this point. Second, I think his beef about being misquoted belongs with the NY Sun, not with me. Look at the subheadline of the Sun piece "Heritage Hails 'Great Step in the Right Direction'" and at the second paragraph "And even some conservatives are praising him for it." It is clear that the Sun reporter concluded Mr. Hederman was enthusiastic about the overall Obama tax plan, not just a limited component of it. I obviously wasn't a party to that conversation, so I can't tell if the reporter treated Mr. Hederman fairly. But as far as I am aware, there was no letter to the Sun from Heritage objecting to this portrayal. Third, on capital taxes Mr. Hederman wants to reframe Obama's "great step in the right direction" as a less egregious step in the wrong direction. This is simply a question of what baseline is being used. In your blog, you have often used the CBO "current law" baseline (see here). This is a baseline under which much of the tax code reverts to how it was at the end of the Clinton years. Under this standard, what Obama is proposing is a big tax cut for dividends (from 39.6 to 20 in the top bracket) and keeps capital gains the same or lower as under the baseline. So under your blog's preferred baseline, it seems like "great step in the right direction" is the correct interpretation (I personally am not a fan of the CBO baseline, but what is most important is being consistent in which baseline one uses). And thanks for helping to build interest in Econ 1420 "American Economic Policy" for the spring. Marty and I do four joint appearances in that class and try hard to help students see why we disagree and not just that we disagree (and, perhaps more importantly, that there is much we agree on). I now have over 2500 friends on facebook. Call me a pushover: I am ready to befriend anyone. (Try me again if, inadvertently, I have ever ignored your request in the past). The problem is, I have no idea what it all means. First, comparisons are made to an artificially high benchmark -- the late 1990s "tech bubble." Second, immigration distorts commonly cited statistics. Third, the census figures understate income gains by not counting fringe benefits. Officials also point out that the current [poverty] measure only counts cash as income. They say a more accurate model would include government assistance like food stamps, housing subsidies and tax credits. Such aid has been devised to help support the poor, but its impact is not calculated by the current measure. Update: The CD blog points out a fifth problem: Data on household income does not adjust for declining household size over time. As seen by Martin Feldstein and John Taylor. "I'm actually flying commercial," Diddy said before walking onto an airplane, sitting in a first-class seat and flashing his boarding pass to the camera. "That's how high gas prices are." the [Bush] administration is now proposing to auction off some takeoff and landing slots to the highest bidder. "The resource is scarce and the best way to allocate it is a price mechanism," said Tyler D. Duvall, the Transportation Department's acting undersecretary for policy. "It's part of a larger picture: We've got congestion on the roads, in our ports, in our airports," Duvall added, outlining the wider policy of the current administration. In each of these cases, he said, the market can best clear the way. But others say auctions will do nothing to resolve the capacity problem, and could cause more confusion and incur more costs for customers than they relieve. "This is an ideological, untested experiment from those in an ivory tower," said Schumer, who has introduced a bill to block the auctions. You can probably guess who I agree with. But then again, I work in an ivory tower. In your blog you cite a Washington Post article that says "But others say auctions will do nothing to resolve the capacity problem..." This isn't quite right. In certain circumstances, the optimal congestion prices send the right signals for marginal capacity expansion. Hence expanding capacity by using the present value of the optimal congestion fees will result in thesocially optimal level of capacity. This is sometimes know as the Strotz-Mohring theorem; see here, pages 6 and 11, for the simple argument. Update 2: A NY Sun editorial on the issue.